We have all come across that crazy teacher who keeps on insisting that commas are just about the most important thing in our lives since they actually help to give proper meaning and perspective to our work. Most of us feel like telling her that she has lost her mind but, out of some shred of respect for her, since she looks rather old and batty, we hold our tongue. Guess what? The teacher probably had the last laugh after all. This is because, when one gets down to simply writing academic style of work, then it becomes very difficult to actually get along without using proper punctuation, a fact that most students appear to realise too late for their own comforts. Commas hold a multi-fact power, as they can help in creating a rhythm, giving meaning to a sentence, highlight the aspect and clarify the intention of the writer. Above all, the power of comma is its emphasis for us to slow down, and pause while we read through. As an example, here are some great sentences and life situations where the writer managed to mess up what they were trying to say quite badly. It is a bad day for me today I can’t eat diarrhoea. It is a bad day for me today, I can’t eat. Diarrhoea. It would not be erroneous to state that you cannot convey exact point to the reader without a comma. Notice how much more comprehensive the second sentence is? That is the power of punctuation! No Parking in front of this gate! Now the first sentence may have punctuation, but it is misplaced leading one to wonder just what the punctuation may have done to deserve such a scold. Procrastination will get you nowhere dedication might help out though. Procrastination will get you nowhere! Dedication might help out though. Notice how in the first sentence here, both dedication and procrastination have been given the qualities of a noun rather than action words! The reason why most students write without bothering to pay too much attention to punctuation, or for that matter, spelling or grammatical errors is because this style of writing is best if one wishes to write the shortest possible text message or a Twitter feed. However, even as students, without perfecting the art of writing a perfect feed or status update, what they are unconsciously doing is preparing the way for their own downfall. In all innocent unconsciousness, students are very liable to repeat text message language, along with all its errors, in their academic paper also. At least they provide the teacher with a good laugh! 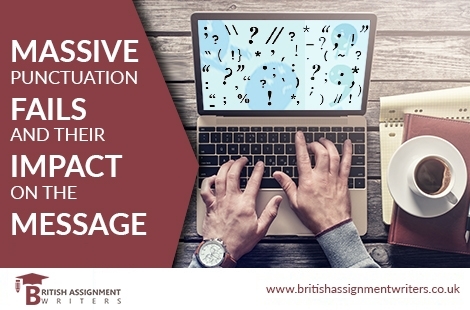 To save yourself from being that one laughing stock, you can opt assistance from British Assignment Writers for impeccable academic essays and assignments.